Each Game Map contains different types of terrain. Pressing the 'G' key twice on the keyboard will bring up a grid overlay showing the different terrain types. You can also press the ‘N’ key to see information about the selected map tile. Terrain types can have different effects on certain units. Some Champion Runes may gain bonuses or abilities when they occupy certain terrain. By clicking the "Options" button or hitting the ESC key in a game, the options window will appear. "Return" - Return to the game in progress. 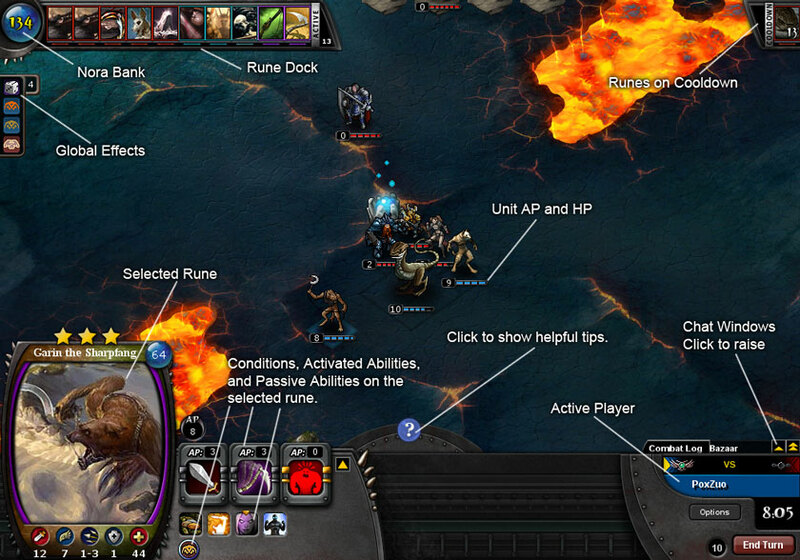 "Options" - Allows the user to view and configure the Pox Nora game settings. "Pause" - Only available in single player mode. This will pauses the game on your turn. "Surrender" - Quit the current match and return to the Lobby. This will be counted as a loss. "Friendly Quit" - Only available in multiplayer matches. If your opponent agrees, you can both quit the match without suffering a penalty. "Quit" - Quit the current match and close PoxNora. This will be counted as a loss. This tab allows the player to view current game effects that are active. These effects include current game settings, faction bonuses and effects generated from Spells, Champion abilities, Relics, etc. The chat window displays the combat log and player chat. Each lobby and match has its own chat window. At the top of the chat window, the arrow tab controls the size of the window. When the chat tab is extended, you can either click on the chat bar with your cursor or you can press the Enter key (or the Return key on Mac) to type a message. You can also whisper by clicking on a Player's rank symbol in the lobby Player list. Other Commands: For a list of all available commands, type the following: /?